(c) Impact of Climate and Air Quality on Health and Agriculture. Development of first ever AIR QUALITY FORECASTING system for Indian Metro cities called SAFAR (System of Air Quality Forecasting And Research). SAFAR-Delhi dedicated to nation during Commonwealth Games in 2010. SAFAR-Pune dedicated to nation on 01st May 2013. and SAFAR-Mumbai dedicated to nation on 23rd June 2015. More. 15 years of Teaching experience. Dr. Gufran Beig has identified important anthropogenic climate change signal in the upper atmosphere and made reliable estimate of role of atmospheric chemistry on regional climate change. 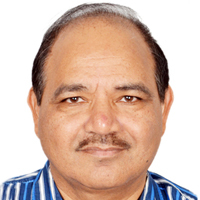 Nominee's work includes path breaking contributions in the area of 'Chemical Climate' which led to the development of first air quality forecasting system in India for Delhi with significant societal impact. Exploited the global change signals in the upper atmosphere which revealed significant cooling resulting in its shrinking, influence to navigation system, satellite movement and lower atmospheric climate-weather patterns. Careful separation of natural variability from climate change signal by the Nominee unraveled a significant anthropogenic cooling trend in the upper atmosphere resulting in shrinking of the ionosphere with significant potential influence on radio propagation and navigation systems. Further, he used coupled 3-D chemistry-climate model to quantifying reliably the role of atmospheric chemistry on regional climate change of the lower and middle atmosphere. In this context, gridded emission inventory of several pollutants for India along with their decadal growth have been constructed and resulted radiative forcing estimated..